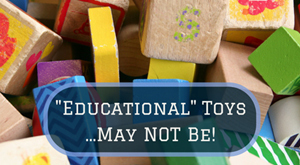 Call me an old fart, but I’m not a fan of new-fangled, ring-ding-dang educational toys. My recommendation to parents always is, don’t easily trust the (sometimes wacko) things that our culture takes for granted are great for kids. Err on the side of “First, do no harm.” Trust your inner knowing and common sense, not the zeitgeist. This entry was posted on Friday, February 27th, 2015 at 2:37 pm	and is filed under Parenting for Peace. You can follow any responses to this entry through the RSS 2.0 feed. You can leave a response, or trackback from your own site.